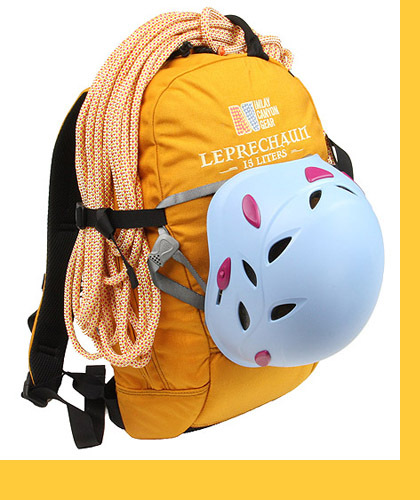 The tight slots of the Leprechaun canyon system deny entry to big dudes, and require small dudes to carry less stuff. 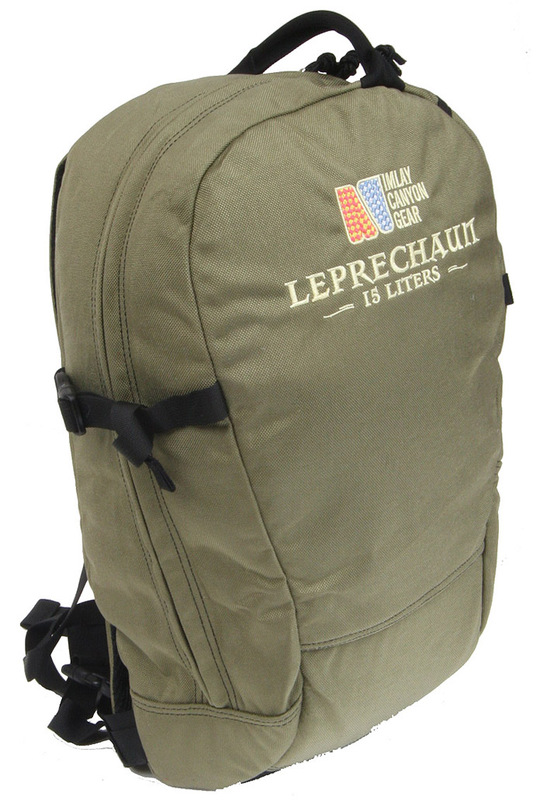 The Leprechaun Pack is a sleek, zip-opening pack designed for these narrow places, and for those who exercise discipline in packing. 1000d Cordura with foam inserts. 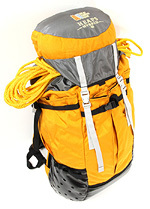 The main material is 1000 denier Cordura, the good stuff. The front and the bottom are lined with 3mm of closed-cell foam which pads any sharp edges inside, which decreases wear on the outside due to rubbing. 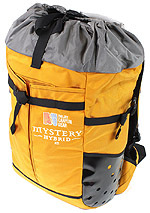 There is a modest 13 oz mesh drain panel at the very bottom of the pack, and interior pockets are made of mesh so there are no water-trapping pockets. 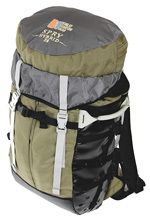 The Zipper is a #10 zipper with double-layer Cordura plackets on both sides to protect it from wear. Still, it is the death of the zipper that generally concludes the life of a Leprechaun. The zipper traverses one side and the top, large enough for access, but with less length exposed for abrasion. This works better than I expected. 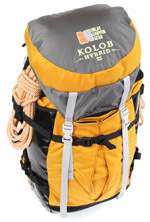 There are just enough straps to hold a few key things on the outside, for the approach, or occasionally a rope while in-canyon. A wetsuit can be draped across the top, and a helmet can be held nicely, with no bouncing around, with the two straps on the front face. Its main feature, though, is its size - big enough to be useful, yet small enough to be smaller than ME. Anything I can fit through, it can fit through somewhat easier. It is also carefully shaped, to maximize its slip-through-the-canyons-icity. I am "X" tall. Will the Leprechaun pack fit me? Because the suspension does not have rigid structures, its shape morphs to fit the person carrying it, within limits. The Leprechaun is especially good on kids and smaller adults - say 4'6" to 5'10" - and fits less well on people smaller or larger than that. Whether it meets your requirements for a good fit is up to you. The zipper is chewed up. Can I get it fixed? Under warranty? Fixing zippers does not work. Replacement is not covered by our warranty, however, beating your gear up is. What "known problems" are there on the Leprechaun Pack?